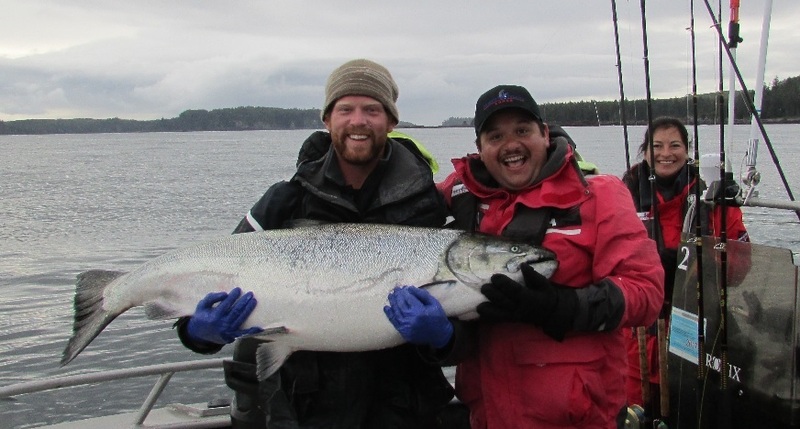 June has become one of the best times of the year to fish the waters of northern Haida Gwaii. There hasn’t been a season in at least the last 10 or maybe even 15 years that was so action-packed from start to finish, a season in which only a handful of days failed to see almost every guest doing a lot of serious business with some of the world’s most explosive species of sport-fish. Just ask anybody who took in the action up north this past summer and they will tell you what kind of a year 2013 was. An examination of catch data by The West Coast Fishing Club guides as far back as 1997 appears to reveal year-over-year evidence that the Salmon are returning earlier than they did a generation ago. This has resulted in June becoming one of the best times to fish the waters of northern Haida Gwaii for several years running. And as Scott and many other guests have noted, the early-season fish often punch above their weight once hooked, especially in years like 2013 when feed was in awesome abundance. But that doesn’t mean there weren’t any large fish in the first part of the summer. On the contrary, The Clubhouse season kicked off June 1-5 with the annual Short Notice Club Derby, with Bob Yoshioka of Seattle taking first prize with a 42-pound fish off Gunia Point. The second trip at The Clubhouse saw many fish in the low twenties and five tyees, with the largest at 43.5 pounds. Just a couple days later, the first guests at North Island Lodge enjoyed similar results, with 43 and 47 pound tyees caught and released. Then on June 18, Fred Shuerenburg set the bar even higher with a 61-pound catch and release off Marchand Reef. Meanwhile the first guests of the season at The Outpost had an epic all-day excursion to Hippa Island, where all boats caught and released more than 30 fish each. By the time another week had passed, the first runs of Coho appeared. And with the exception of a couple of brief spotty periods between runs, the hit parade just kept rolling along all summer long. While Salmon remain one of the planet’s most mysterious and unpredictable species, the abundance of fish that turned up in 2013 is hopefully a positive indicator that the Coho and Chinook Salmon fisheries may be in better shape than they have been in recent years, and that just maybe the years of conservation efforts on the part of government and sport fishers are paying dividends. West Coast Fishing Club Vice President Brian Grange credits grassroots conservation organizations, responsible anglers and Fisheries and Oceans Canada for playing the lead roles in maintaining robust Salmon populations. He also commends Fisheries and Oceans for imposing size limits on Halibut this past summer, by which anglers are permitted to keep one large Halibut up to 126 centimetres (approximately 50 pounds) but must now release the larger egg-bearing females.